Located 1/4 mile west of Loop 101 and Peoria Avenue, a full diamond interchange. 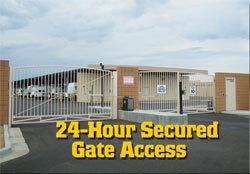 You have access to your vehicle 24 hours per day, 7 days per week. Card and/or personal access code required. Perimeter block wall with extensive lighting and a 24-hour video surveillance system. We have on-site resident managers providing additional security and customer service. Choose from uncovered, covered canopies, or enclosed garage spaces. We have spaces that range from 10 ft to 13.5 ft wide and from 20 ft to 49 ft long. 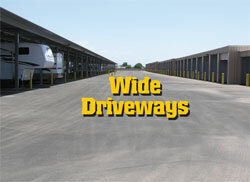 Our driveways and turn around areas are nice and wide offering easy maneuverability. Our parking areas and driveways are fully paved thereby minimizing dust and keeping your vehicles clean. Use our covered wash bay to clean your RV, boat or trailer. Nominal use fee. On-site and available free for your convenience. Available for free when you need power to work on your vehicle. Enclosed and evaporative cooled building with mini storage / self storage units for your additional household and recreational items that need storing.